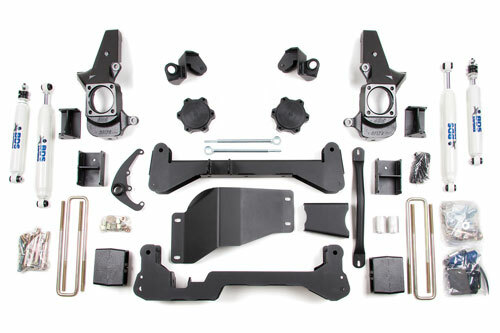 This unique High Clearance suspension lift kit utilizes high arched crossmembers that blend perfectly with the angle of the factory installed lower control arms for a completely integrated look while lifting your vehicle a full 4-1/2" dramatically increasing ground clearance at the front crossmembers and improving operating geometry. A front differential skid plate comes standard, for increased off road protection. The rear is lifted with a flat 3" block for easy installation. 20" wheels with 5 1/2" to 5 3/4" of backspacing recommended to reduce trimming. Gas models require exhaust modification. Narrow track knuckle option will slightly increase turning radius. If equipped with stock 17" wheels, then must replace with 17" or larger. Rear box kit will not fit dually applications. Larger u-bolts are necessary.